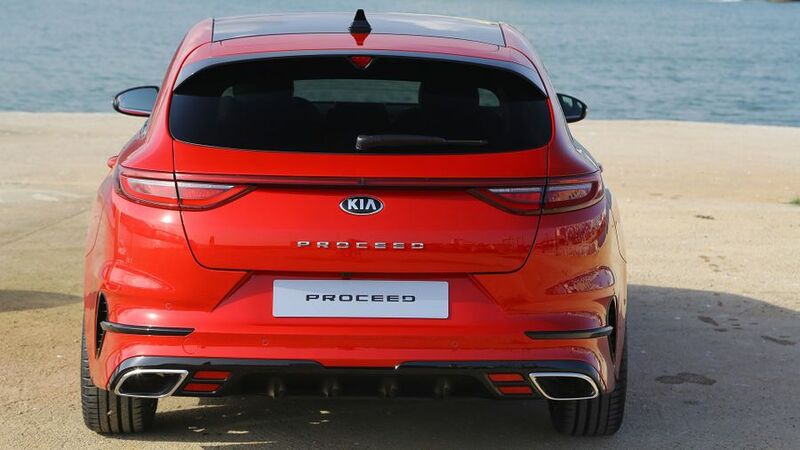 Kia has unveiled its latest addition to the Ceed family, the ProCeed. It’s a sporty, five-door shooting brake (cross between an estate and a coupe) version of the Ceed hatchback. It’s based on the concept ProCeed shown at the Frankfurt Motor Show last year. Kia made huge strides dropping the weird apostrophe from the Ceed name, and it’s now gone one step further and got rid of the weird underscore from the ProCeed, too. 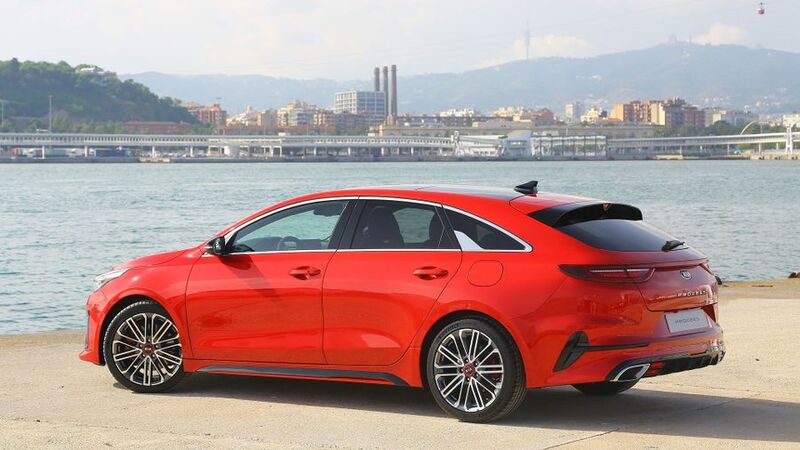 The ProCeed will certainly be attracting comparisons to the Mercedes CLA Shooting Brake, but will be more of an affordable option for buyers. 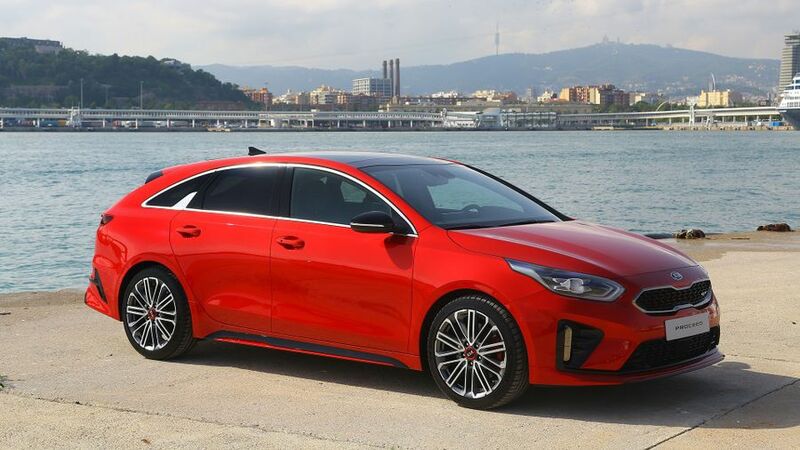 More generally, Kia is trying to position itself more towards the premium end of the market, and cars like the ProCeed will definitely be helping that image. Of course, you’ve got the usual Kia signature style bits: the tiger nose grille and the ice-cube LED daytime running lights. But apart from the same bonnet and front wings from the Ceed hatchback, the ProCeed is pretty different. The low, sleek shape of the ProCeed looks excellent in the metal. And it looks great from the back, partially thanks to the full-width LED lights. It'll attract a lot of buyers on looks alone. Buyers will be able to choose from ten paint finishes in the ProCeed. The GT-Line trim models will have 17 or 18-inch alloy wheels, and ProCeed GT models are fitted with 18-inch wheels as standard. What's the interior like and how practical is it? 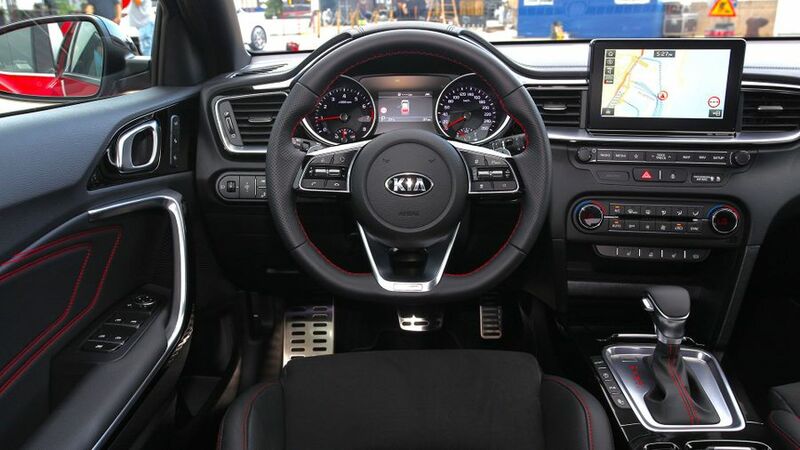 The interior is very much like the Kia Ceed hatchback, with a few nods to sportiness and style. Comparisons to the Ceed hatchback are in no way a bad thing, either. The small differences are that you sit lower down, there’s a bit less headroom, and a rather more hampered view out the back compared with the standard Ceed. But of course, that’s the price you pay for style. There are a few sportier touches in the cabin, too: a black cloth roofliner (instead of a grey one), metallic scuff plates, flat-bottomed steering wheel, and sports seats on the GT model. Tech-wise, there’s a 7.0- or 8.0-inch touch-screen to choose from, which both give you Apple CarPlay and Android Auto connectivity. Bluetooth and DAB are standard, and you can upgrade to a fancier JBL sound system. Sat-nav is available on the larger screen. Other extras you might want to add to your wish-list include a heated windscreen – which is super helpful in winter – a wireless phone charger, heated/ventilated front seats and heated rear seats. Taller adults will have a bit of fun initially getting into the back seats, but once you’re in, it’s absolutely fine. 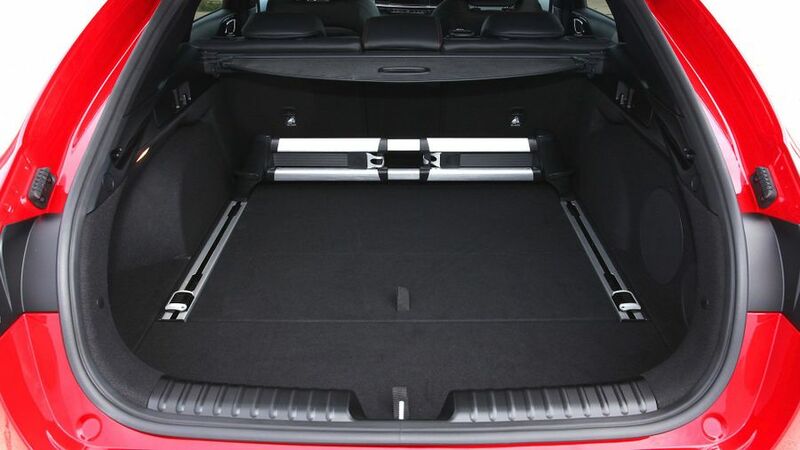 The boot gives you 594 litres of space, which is 200 litres bigger than the normal Ceed. There’s also a very small load lip, and it rides lower than the Sportswagon, so it’s easy to pop your stuff in. What engines can you get with it? You can only get the Ceed in sporty-looking GT Line trim, or the sporty, higher-performance GT model. The ProCeed GT is powered by a 1.6-litre turbocharged petrol engine with 204 horsepower. If you opt for the GT-Line model, buyers can choose from three engines, which are also available in the standard Kia Ceed, and are all good. They are a 1.0-litre petrol engine with 120 horsepower and a manual six-speed gearbox, a 1.4-litre petrol engine with 140 horsepower available with a manual or seven-speed automatic gearbox, or a 1.6-litre diesel with 136 horsepower with manual or auto. What safety kit can you get? You get a decent amount of advanced safety kit as standard, which includes High Beam Assist, Driver Attention Warning and Lane Keeping Assist with Forward Collision-Avoidance Assist. And there are plenty of optional extras, too: Lane Following Assist, Smart Cruise Control with Stop & Go, Blind Spot Collision Warning, Rear Cross-Traffic Collision Warning, Smart Parking Assist, and a pedestrian recognition with haptic steering wheel warning, which you can get as an add-on to the Forward Collision-Avoidance Assist system. Plus, there’s Kia’s excellent seven-year, 100,000-mile warranty. When does the ProCeed go on sale? 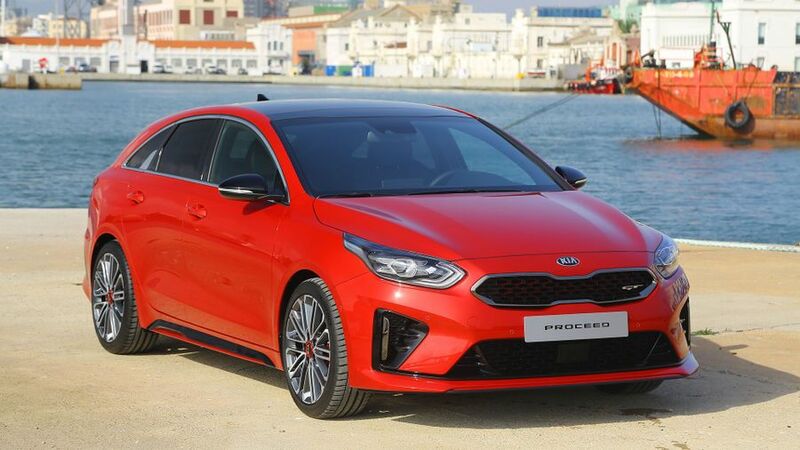 The ProCeed will only be available for European customers, and Kia will be taking orders in the first quarter of 2019. It’s expected to cost from around £21,000, up to a bit less than £30,000 for the top-of-the-range GT model.